In the ancient Greek civilization, the word "polis" meant the city center, the city-state. Inside the polis, the "asty" word was used to identify the lower part of the city, what we would define today the working-class houses, where the cityscape was marked by small houses one near the other along small muddy streets. I'm not completely sure that the thinking mind behind Monrio, Giovanni Gazzola, to find the name of his entry level integrated amplifier Asty got his inspiration from the ancient Greek civilization, but without doubt this is a product which, even giving up something in expressing a substantial sound and a design quality level, it's addressed to a user segment that is not especially wealthy or, however, is not willing to invest "serious" money to buy the amplification of its audio system. The Asty is rather simple but really impeccable. The front panel is realized with a thick (about 1cm) brushed aluminum plate, which noteworthy (and cleverly) has trimmed off edges. The same panel accomodates, partially embedded and yet protruding, four knobs controlling the inputs selector (Tape, Tuner, CD, Aux1, Aux2), the balance, the volume (remote controlled in ST and RM models) and the unit switch, whose state is indicated by a red color led placed in the center of the panel. The cabinet, realized in metal plate, follows the same aesthetic of the front and, even this one, is trimmed off so to eliminate sharp edges. The rear panel could seem quite unimportant, with the IEC socket, the binding posts for the speakers power cables, and the RCA plugs that replicates what is on the inputs selector. Nevertheless, a couple of inputs marked "Direct", do attract our attention. Just reading the operative manual we discover the mystery: this is the input that allows the connections of an Audio/Video processor, so that we can use the Asty in a multichannel system as front or surround channel amplifier. To activate the Direct input a change in the position of a couple of bridges placed inside the unit is needed. 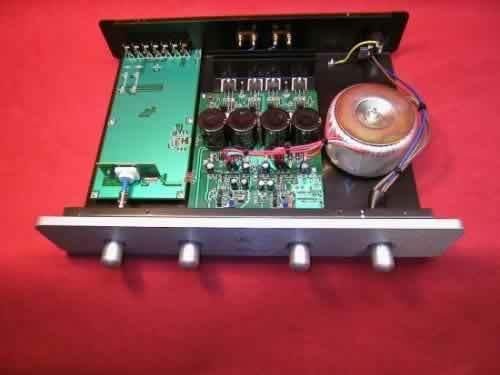 The Asty is an integrated amplifier rated 55W per channel on 8 ohm. A look inside the unit is surely worthwhile, as it allows to appreciate a very tidy project design, with cabling reduced to the minimum possible, and with the choice of the selected component. Internally, the unit seems schematically divided in three separated areas: the power supply is on the far right, where a very nice toroidal transformer, with separated main secondary for the left and right channel, stands out, the input stage on the left, and the preamplifier section and amplification stage in the center, with the four output stages mounted on heat sinks directly coupled with the unit frame. Power supply appears oversized, with about 40.000uF of filter capacity and Ultra-Fast diodes, that should guarantee a current reserve enough for peaks and transients. No capacitors are placed on the signal path. Only Audio-Grade "MUSE" electrolytic capacitors and polypropylene film capacitors are used where needed. The size 430x80x310mm (W-H-D) is within standard, and the overall weight is 10Kg. The bass range represent a good compromise between velocity and mildness, and it seems quite full and with a body, even thought I will not say tense and nervous, but enough articulated to allow listener to grasp the virtuoso of a bass player. In these price class you cannot really expect miracles from the very low bass range, and the Asty is not an exception, as the energy seems to decrease when the sound message offers frequencies near the audio "hell". Midbass is very nice, and it gives the right substance to voices and instruments, without introducing any coloring, something that perfectly melts with the midrange, that is very well present and positively warm in character. The high midrange looks moderate and not very exhibited, possibly a little bit shy, but really relaxing and satisfactory, while the top high edge of the audio spectrum shows very good extraction qualities together with a fine level of width. The dynamic performance, without feeling any particular deficiency, is quite good, and it it catches on, as a really suitable partner, a balanced and not very accentuated reproduction pace. It results in an appreciable synergy, which contributes by far in determining the quite neutral, while smooth and enjoyable, character of the unit. The ability of the integrated amplifiers to restitute the soundstage is, far and wide, very satisfactory, and really good considering its class level. Very rarely the lateralization would override the position of the speakers, and the sound message is well disengaged from them, while it presents focused and enough extended elements, with a gratifying feeling of depth and an identifiable soundstage scanning ability. This unit has a quite "universal" character, and it does not have any noticeable musical idiosyncrasies. However I will try, in any case, to avoid the combination with very low efficiency loudspeakers and with the ones that do have an extra and low controlled bass range. Instead it does not seem there are specific problems for what regards load, as the unit has exhibited, during tests, the ability to drive even rather difficult loudspeakers. The Asty has shown itself to be quite (and pleasantly) aware of the power supply cable, and it shown an appreciable improvement using our TNT-TTS. Surely useful is to place a sort of a weight on the cover (something similar to our TNT Press), so to limit a certain tendency to resound that, while listening to recordings at quite high volume, contaminates the cleanness of the sound message. This very interesting integrated amplifier represents a further example of what the italian school is able to realize in the field of small amplifications: well assembled, well playing, nice and ease aesthetic and provided of distinct identity. If in your plans there is the one to buy a good and excellent integrated amplifier with a proven musical and assembling quality, go and listen to it in this last version, I'm sure you will not regret it. A warm thanks goes to Audio Team, and especially to Giovanni Gazzola, that gave us the chance to verify "on field" Monrio Asty performances.